SPECIFICALLY, WHAT IS THE GOAL OF THE PROJECT FOR WHICH YOU ARE REQUESTING GRANT MONIES? HOW WILL YOU MEASURE YOUR PROJECT’S SUCCESS? HOW WILL ANGELES CONSERVATION FOUNDATION PARTICIPATION BE RECOGNIZED? Programs receiving grant funding will meet guidelines for 501 (c) 3 purposes seeking to promote environmental awareness and education through literature, outings, or conservation activities. 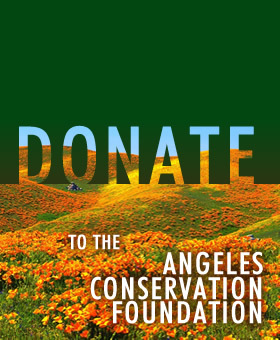 All decisions to award grant funds to a specific proposal rest solely with the Board of Directors (Board) of the Angeles Conservation Foundation. Grant applications must clearly outline the program details in accordance with the required format, using additional space as required to adequately complete the description. Programs will generally be selected which the Board believes will appeal favorably to donors in future fundraising appeals. Extra weight will be given to programs which are generally consistent with environmental goals of the Foundation. Although participation in important legal issues is not cause for grant rejection, programs involving local actions under the California Environmental Quality Act will generally not be awarded funds. Funds will generally be awarded on a reimbursable basis only after presentation of a receipt for expenditures or invoice which clearly demonstrates that the funds were used in accordance with the purposes outlined in the application.